Water balance: relationship between inputs and outputs of a drainage basin. 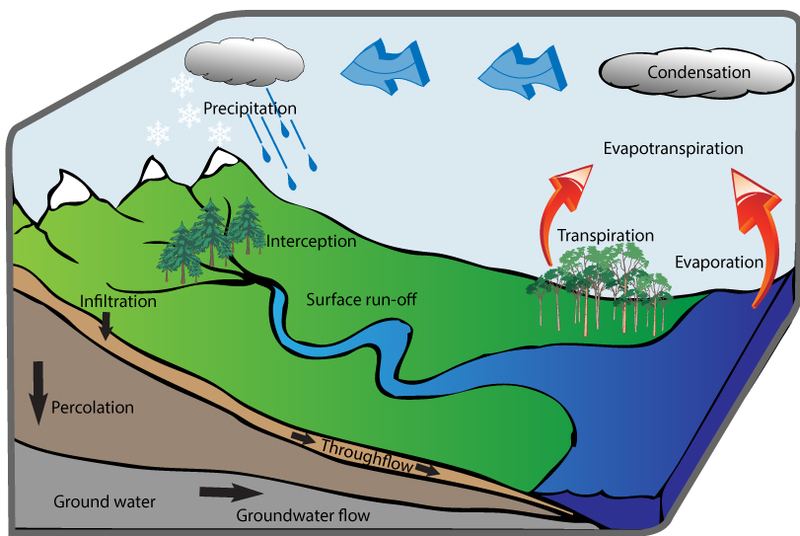 Precipitation = Q (runoff/discharge) + E (evapotranspiration) +/- changes in storage. 2. Identify stores (groundwater, lakes, clouds) and transfers (precipitation, evaporation, throughflow etc). Climate change is reducing the volume of water stored as ice. Watch video A1, describe why mountain glaciers are so important for many people and economies. What are the likely effects of reducing mountain glaciers? Drainage Basin: The area drained by a river and its tributaries. Drainage Divide: Also known as a watershed, it is the line defining the boundary of a river or stream drainage basin separating it from adjacent basin(s). *source, tributary, confluence, channel, floodplain, mouth, delta, distributaries. * River profile & characteristics: upper, middle & lower valley. Bradshaw model. Waterfalls. * River discharge: define, measurement (cumecs). 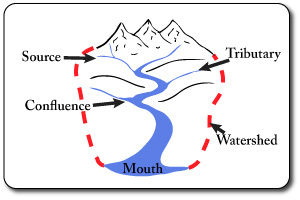 Figure A3: Bradshaw model shows how rivers change as they move from the source to the mouth. Study the model and make sure you can explain why some factors increase while others decrease with distance from the source. River profile & characteristics: upper, middle & lower valley. Bradshaw model. Waterfalls. River discharge: define, measurement (cumecs). 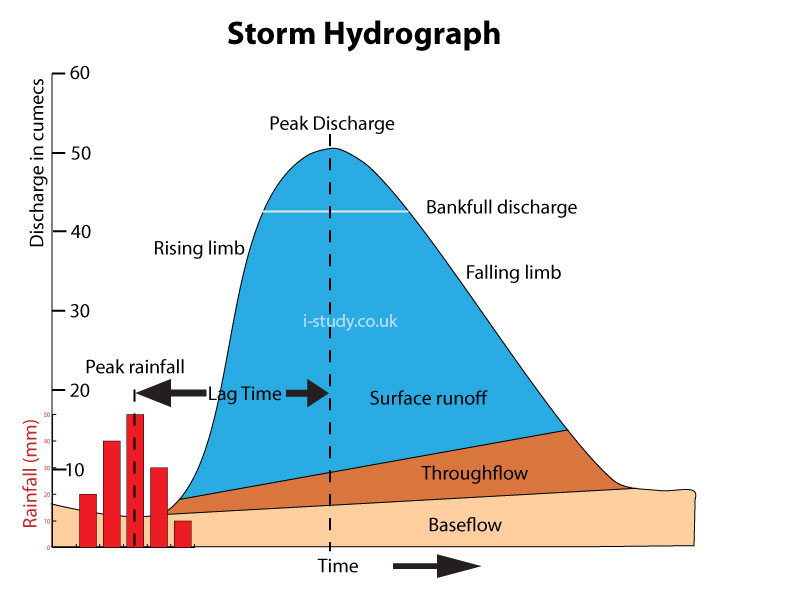 Describe the factors affecting the hydrograph: basin shape/size, drainage density, human influence, slope gradient, climate, soil type, vegetation. How do these affect the lag time and peak discharge? Explain the purpose & use of hydrographs in predicting floods and the frequency of occurance of floods. Flooding is the most obvious and devastating hazard of living close to rivers. Pakistan experienced severe flooding in 2010 that displaced millions of people. Watch Video 2.31 and use these links:Interactive map, about news. Describe the main effects of the floods (people, economy, food supplies). Use this article to describe some of the methods being used to reduce the impact of future floods. 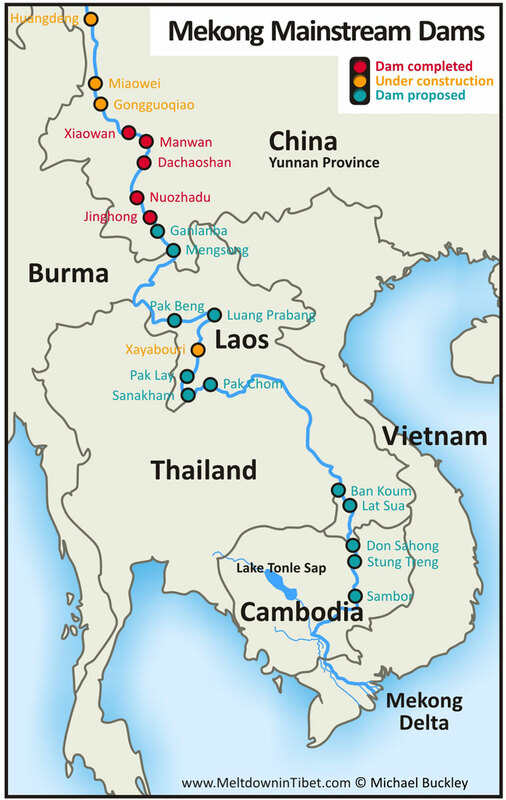 When & why did Laos build the Nam Ngum dam? What was the environmental impact of building this dam? Why does Laos want to build more dams? How many dams is it proposing to build over the next 15 years? What are the negative impacts of dams in general that are mentioned? What is the human population in the lower Mekong region, relying on the river? 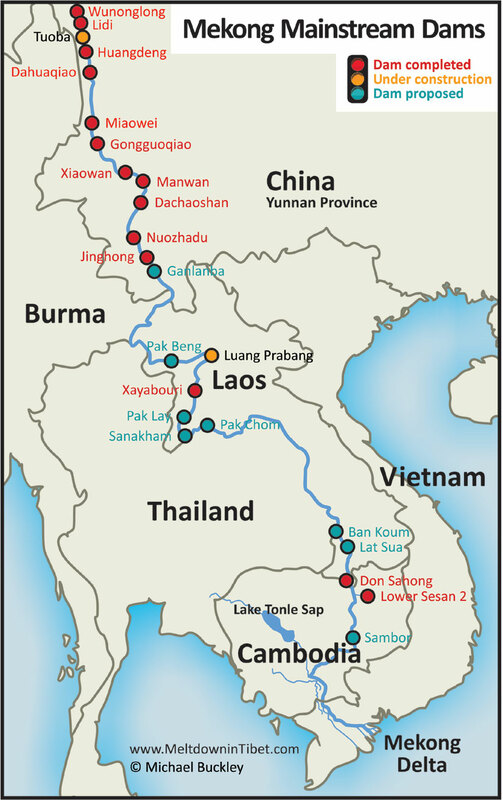 What are the major concerns about the Don Sahong dam? Why is the the Lower Sesan 2 dam considered the most ecologically damaging? Explain why the delta is under threat (why is it sinking)? How much sediment used to reach the sea & how much reaches it now? 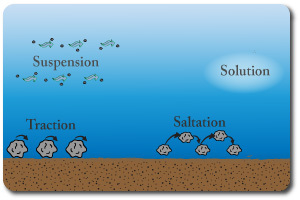 Describe the reasons why the sediment load has reduced so drastically. You should be able to explain where these erosional processes take place eg: attrition and abrasion occur largely in the upper course where the larger more angular rocks scrape and collide when they move. Hydraulic Action: pressure/force of the water loosening material & widening cracks in the river bank. Abrasion: the scraping action of material being transported. Attrition: the breaking of stones when they collide with other material. 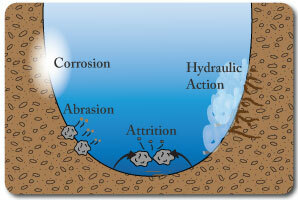 Corrosion: the dissolving of rock (limestone etc) by acid in the water. You should be able to describe the changes in the typeof transportation that occur with distance from the source. Traction: the rolling of stones & rocks. Usually larger rocks. Saltation: stones/rocks bouncing. Usually smaller rocks due to the energy required. Suspension: very small particles being carried along in the river current. Maximum Sustainable Yield: Maximum Sustainable Yield: The maximum level of extraction that can be maintained indefinitely for a given area. Use p.126 to define groundwater and aquifers. How can it be replenished naturally? Read this article (Namibia) and describe the importance of discovering groundwater in Namibia and the challenges of extracting it. Use this article (India) and page 127 in your book to describe the impacts of unsustainable groundwater use. Use Video A1:4 to make short Case Study notes about the impact of groundwater extraction in Holland. Wetlands: Areas that are regularly saturated by surface water or groundwater, including freshwater marshes, swamps and bogs. Wetlands are an important ecosystem supporting a wide species diversity. They also filter water passing through them removing many pollutants. In addition they can play a significant role in reducing flood risk. Many wetland systems around the world are under threat due to development. Where is the Kissimmee river. How, why & when was it altered? Why is it being restored? How is it being restored? What is the financial cost of restoring the wetlands? Eutrophication: nutrient enrichment of streams, ponds and groundwater. Read & make notes about the the impact on a global scale that fertilisers are having. Why have they become so essential for food supplies, but also for economies that rely on agriculture? What is micro-dosing and how can it help overcome? Mini-series looking at water shortages in Peru. Watch the 3 videos (A7 to A9). Draw or get a map that shows where the Andes and Peru are. The effects on the local people - why is there conflict? Ideas about what can be done. The Nile flows through many African countries ending in Egypt at the Nile delta. Egypt is almost completely reliant on the Nile as a source of freshwater due to its desert climate. Most of the countries it flows through are experiencing rising populations and the need to grow more food. Their economies are slowly industrialising and require more electricity. These factors are resulting in more water being demanded from all the countries which is leading to conflict. Annotate a map showing the countries that the Nile flows through and why they are potentially requiring more water from the Nile. Describe the historical agreements over the Niles water. Why are Ethiopia and Uganda wanting to use more of the Niles water upstream? Why is Egypt strongly opposed to other countries using more of the water from the Nile. Do you think that the other African countries should be allowed to take more water from the Nile and to dam it? Support your answer with reasons and examples.